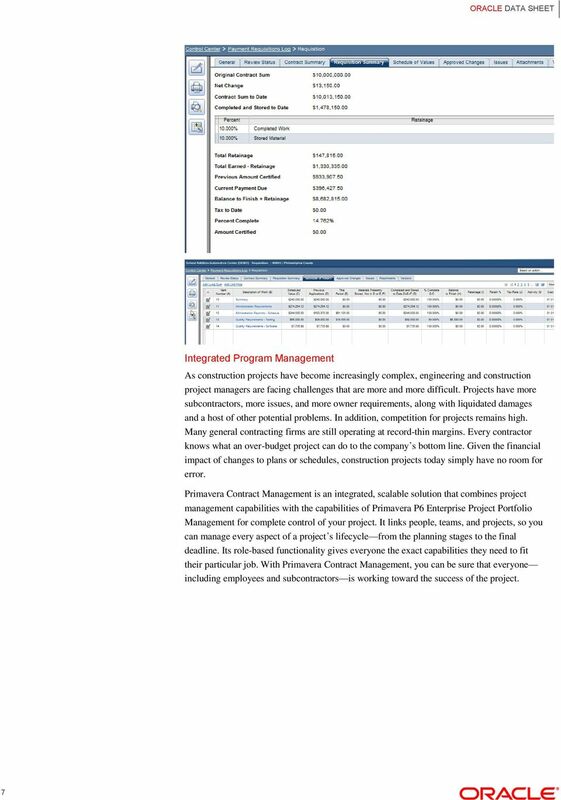 Download "ORACLE S PRIMAVERA CONTRACT MANAGEMENT, BUSINESS INTELLIGENCE PUBLISHER EDITION"
1 ORACLE S PRIMAVERA CONTRACT MANAGEMENT, BUSINESS INTELLIGENCE PUBLISHER EDITION KEY FEATURES NEW: Oracle BI Publisher NEW: UPK Support NEW: Technology Enhancements NEW: Web Services Powerful dashboards and reporting tool Comprehensive change management Superior job cost management KEY BENEFITS Increased document control across entire project Enhanced usability Easily access key performance indicators with dashboards and reports Provide specific functionality for everyone on the project with role-based solutions Completing projects on schedule and within budget demands complete project control. 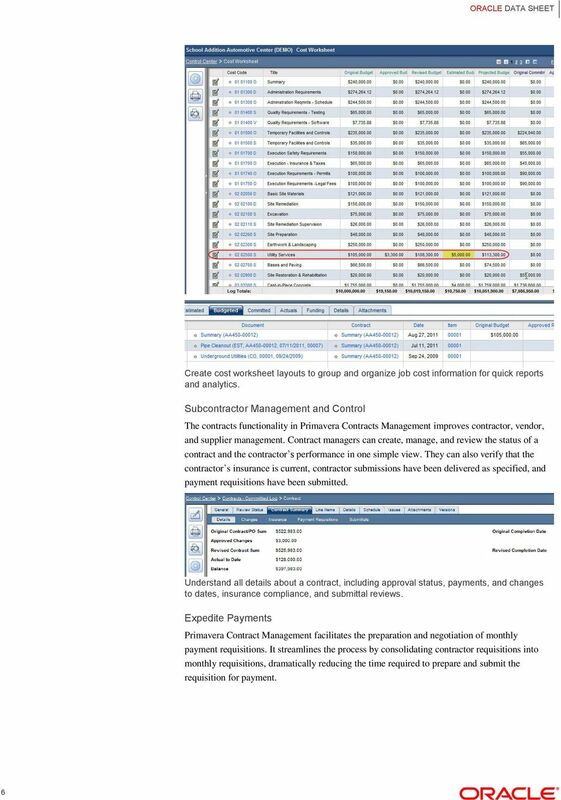 Primavera Contract Management from Oracle is a document management, job cost, and project control solution that increases the efficiency and speed of construction project management while reducing schedule delays and risk. 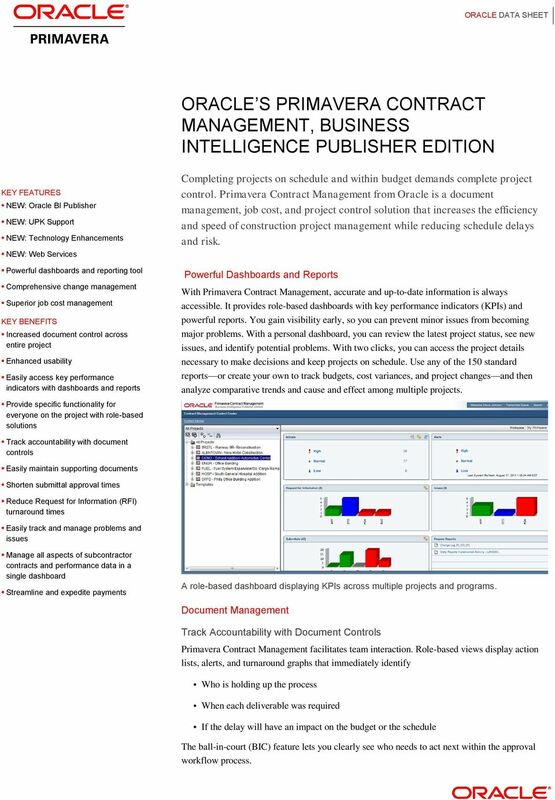 Powerful Dashboards and Reports With Primavera Contract Management, accurate and up-to-date information is always accessible. 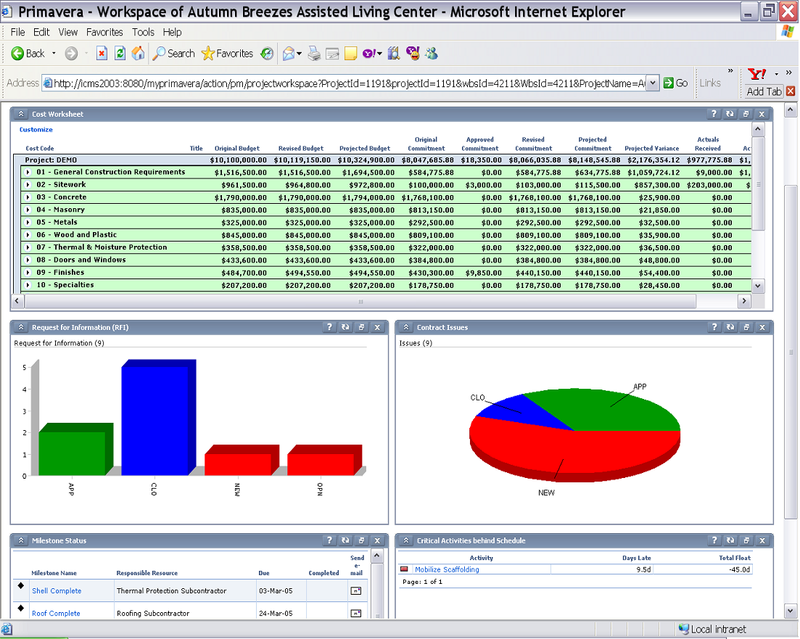 It provides role-based dashboards with key performance indicators (KPIs) and powerful reports. You gain visibility early, so you can prevent minor issues from becoming major problems. With a personal dashboard, you can review the latest project status, see new issues, and identify potential problems. 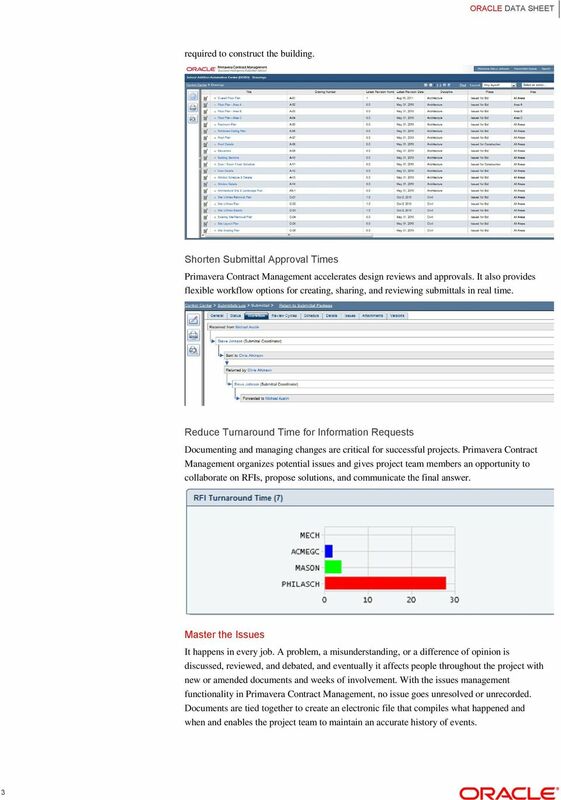 With two clicks, you can access the project details necessary to make decisions and keep projects on schedule. 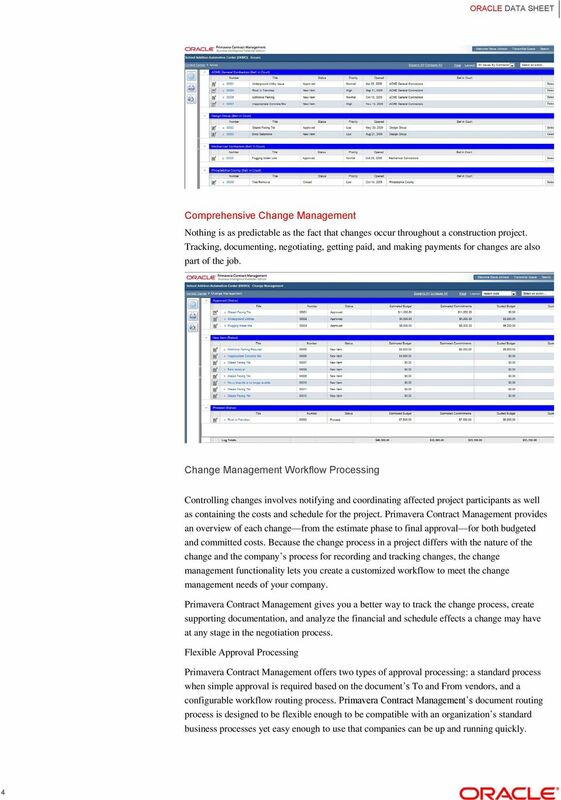 Use any of the 150 standard reports or create your own to track budgets, cost variances, and project changes and then analyze comparative trends and cause and effect among multiple projects. 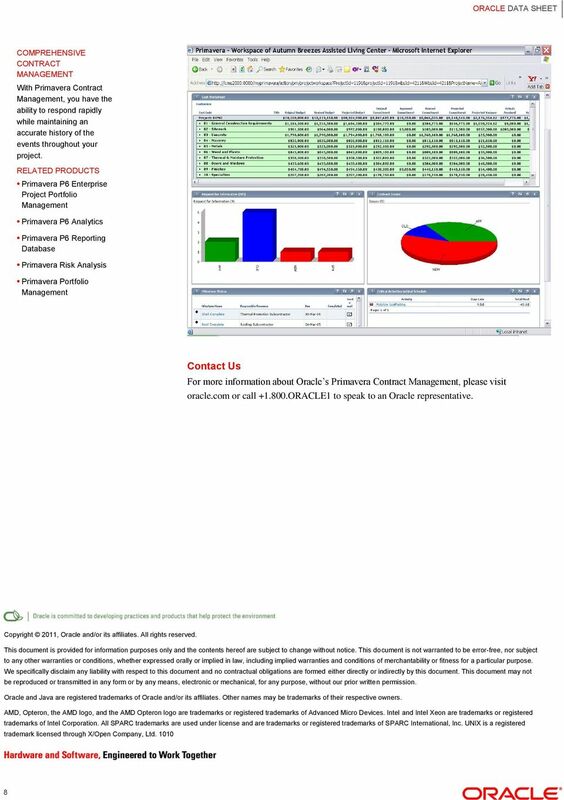 Track accountability with document controls Easily maintain supporting documents Shorten submittal approval times Reduce Request for Information (RFI) turnaround times Easily track and manage problems and issues Manage all aspects of subcontractor contracts and performance data in a single dashboard Streamline and expedite payments A role-based dashboard displaying KPIs across multiple projects and programs. 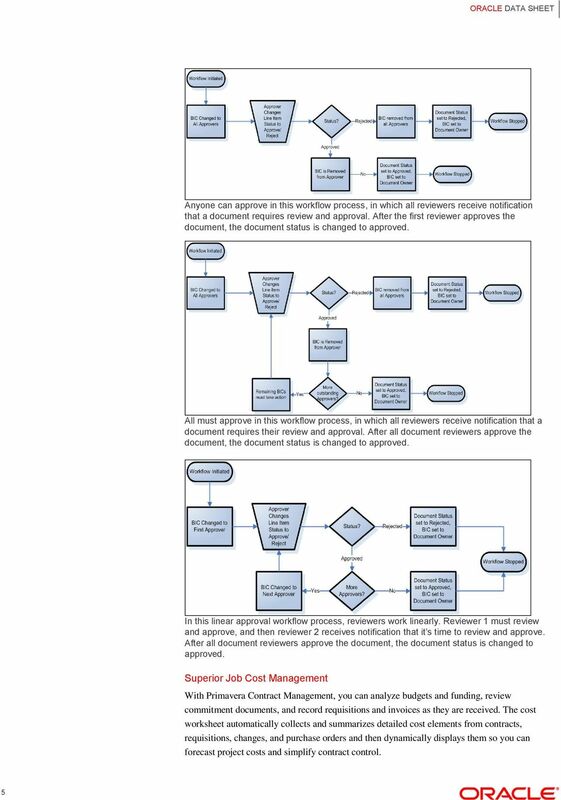 Document Management Track Accountability with Document Controls Primavera Contract Management facilitates team interaction. 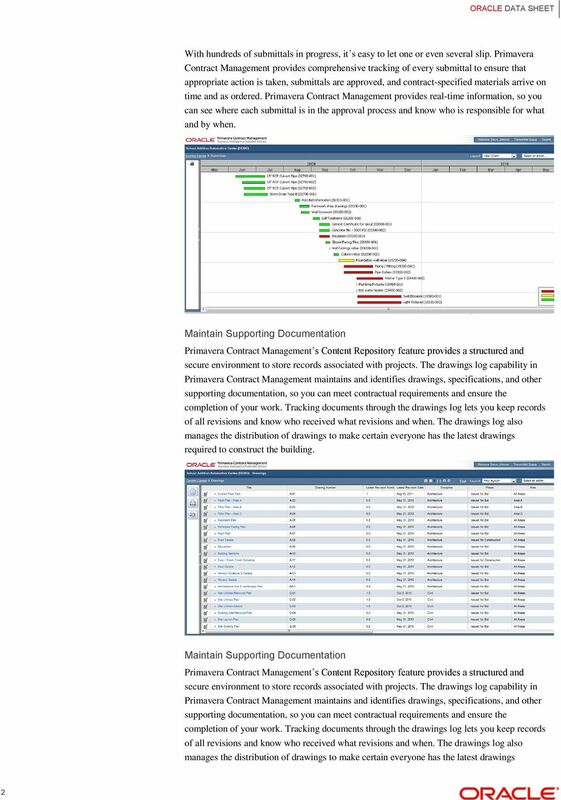 Role-based views display action lists, alerts, and turnaround graphs that immediately identify Who is holding up the process When each deliverable was required If the delay will have an impact on the budget or the schedule The ball-in-court (BIC) feature lets you clearly see who needs to act next within the approval workflow process.